A great way to experience over 200 beautiful Vinci & Rakos Parfums. 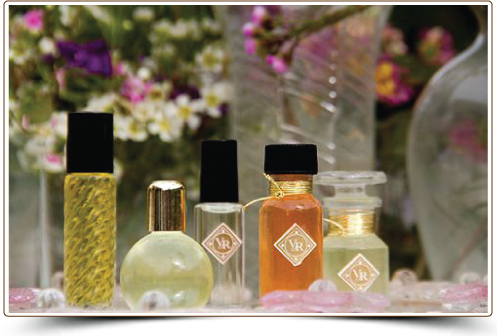 Each sample is a full-bodied Parfum with no added alcohol. 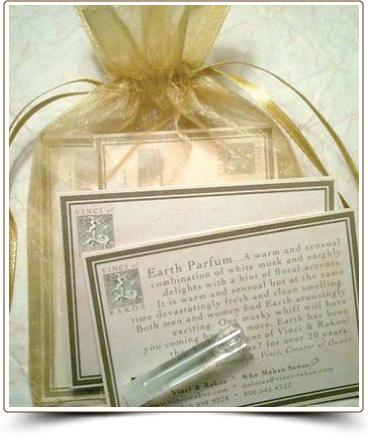 $25.00 for seven (7) Parfums of your choice, packaged in a drawstring organza bag. The Parfums are presented on individual vial cards so you can record your comments and keep track of your personal preferences. Size of vial is a 1/6 dram with plug top and tiny dip wand. The Parfums have been arranged two ways to help in the selection of a new scent: Alphabetically and By Predominate Notes & Categories. The Parfum categories and descriptions were based on years of working and listening to the comments, preferences and interpretations of my clients, as well as their memories. The sense of smell is very subjective and emotional, so no one will ever describe an aroma the same way, agree which category would apply or which notes are in a blend. The descriptions were written with these ideas and thoughts in mind, so many of the Parfums are listed in more than one category, and reflect the views of the clients. If pertinent, a reference to a fragrance type on the market is indicated. The Vinci & Rakos Parfum descriptions are available in two versions.